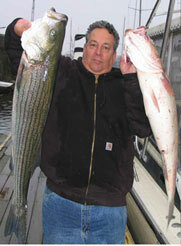 We not Only Do Striped Bass Charters. Are Also Well Known For Our Wreck Trips! We have A Variety Of Trips Available To Meet All Your Needs. in most cases directly from the deck of the Lady L.
No answering machines - just fishing answers !!! Call Us Today and get in on some of the finest fishing we've seen in years. Call Captain Rudy for an up to the minute fishing report! Copyright 2005-2009 © Lady L Charters Brooklyn New York. All rights reserved.